Dingle half and full marathon takes place around the spectacular Dingle Peninsula on Saturday 1st September 2018. 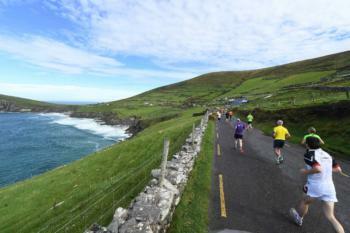 The course consists of a Half Marathon (13.1 miles) and a Full Marathon (26.2 miles) which traverse the spectacular Dingle Peninsula. This is a ‘must do’ event in one of Ireland’s must beautiful locations on Slea Head with the course designed for runners and walkers to enjoy its breath taking scenery and beautiful rugged coastline. This is the only day in the year when vehicular traffic is removed from Slea Head immersing runners in the natural beauty of the Dingle Peninsula on the Wild Atlantic Way. Both the half marathon and full marathons start together from the scenic Marina in Dingle Town with all participants heading off together in the direction of Ventry and onto Slea Head. The scenery is truly breathtaking with magnificent views of the Blasket Islands. How to Find Start Line: Both the half marathon and full marathons start together from the scenic Marina in Dingle Town. Nearest Parking: We provide dedicated free car parks on the approach to Dingle Town from 7am Saturday morning. These are approximately a 5/10 minute walk from the start line. Please follow event signage and Gardai (Police) and stewards will direct you into same.